Machine embroidery patches are a great way to add some personalized flair to your wardrobe. If you have a sewing machine they're pretty easy to make once you understand the materials you need. If you've fallen in love with machine embroidery patterns then you need to become familiar with the bobbin thread. It will bring delicate color and charm to all your machine embroidery projects. Bobbin thread is a lightweight thread. 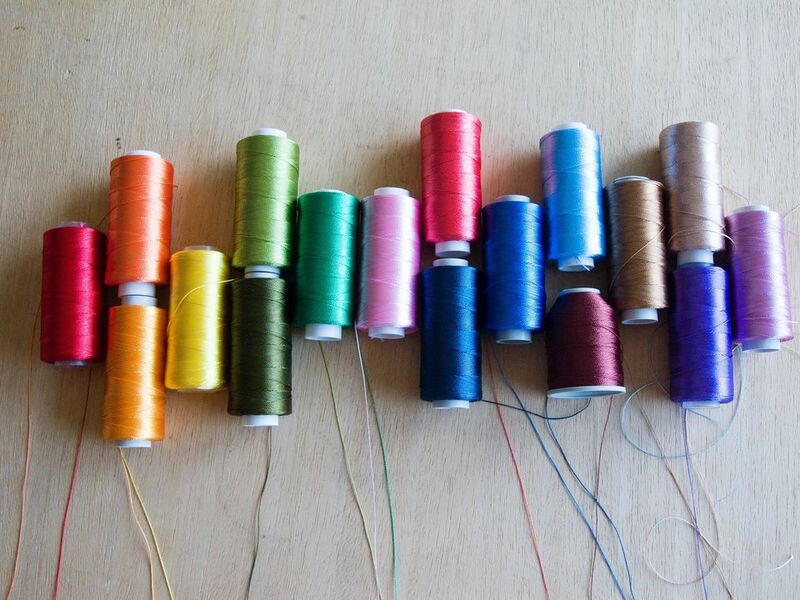 As with most threads, it comes in a rainbow of different colors, suitable for all your projects. This thin thread is most commonly used in the bobbin of a home sewing machine, but it does have other uses in sewing. Although it is called bobbin thread it is not the thread that is always used in a bobbin. Most sewing will use the same thread in the upper threading and the bobbin of a sewing machine. Bobbin thread is a lightweight thread for machine embroidery or machine basting. When bobbin thread is used for machine embroidery, it allows the back of the embroidery design to be much less dense than the front of the design. This is especially helpful when you are embroidering lightweight fabric. It prevents the already dense embroidery from being even more dense and rigid than the fabric and keeps it more pliable than it would be with regular thread in the bobbin. Machine basting with bobbin thread will leave the lightweight thread to be removed, and because the thread is lightweight, in many instances it can be left in rather than fighting to remove the basting. When bobbin thread is used for machine basting, it is a more delicate thread than your regular sewing thread. It will not overpower the fabric in any sense. As with any sewing thread, quality does make a difference. A quality bobbin thread can be almost as strong as normal sewing thread. Regular weight sewing thread would be used in almost all sewing but bobbin thread is a welcome addition to your sewing basket when the need arises. Sewing very fine fabric is one occasion that you will love working with bobbin thread. Since bobbin thread is a thinner thread, it will not be as overpowering as regular weight sewing thread. A machine blind stitch sewn with bobbin thread on sheer fabric can be much more invisible than if it is sewn with regular thread. Since bobbin thread is thinner, don't sew areas of a garment or item that will rely on the strength of the seam. You would not, for example, want to sew the crotch of even lightweight pants with bobbin thread. Since a crotch seam is dependent on seam strength, bobbin thread is not the best choice. Under-stitching and hems are two common areas to use bobbin thread to prevent overbearing thread appearance.